is a really silly title for this post but honestly, I don't think I've ever blogged three times in one day on the same blog before. I'd been watching the achocha with some interest, since it's the first year I'd ever grown it. It wasn't doing much, just getting taller and taller as it climbed the net tied onto the compost heap. There'd been some little flowers but nothing fruit-like was setting. I hung on, hardly caring because (did I say?) I've been a tad depressed anyway for the last couple of weeks. Still, on twitter yesterday, emmathegardener was talking to rhizowen about someone else's problems with it and that spurred me on to having another look for myself. With some help from Appalachian Feet who has some sensible advice and good pictures I managed to identify the start of fruit on my own plants. 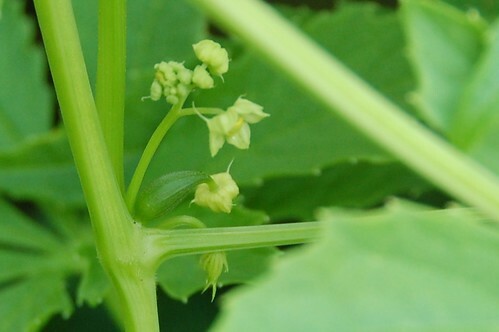 All the flowers are very tiny and as with other cucurbits the male ones are often seen first. They come out in an inflorescence on a relatively tall stem. 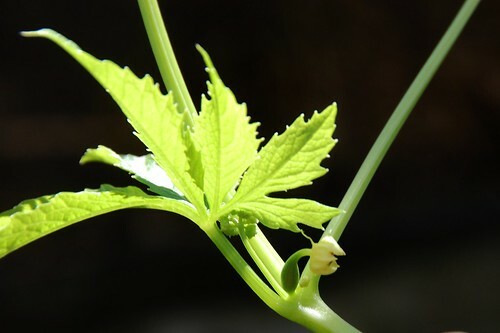 The female flowers are singular with tiny fruit behind them, growing in the leaf axils, and have almost no stem at all. They're still very small on my plants but now they've started I'm sure they'll be romping away in no time. By the way, does anyone need any courgettes, as I have a few spare? 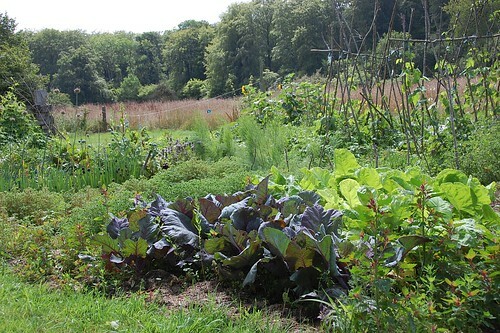 The rest of the garden is looking verdant after so much rain although there are signs of some sort of leaf disease on the cucumbers and the other pumpkins and squash have mildew to greater or lesser extents. The happiest plants of all are the weeds which will have to be attacked quickly before they take over. Everything needs a good clear up and then more crops planted for autumn. If the weather stays bright it might even happen. I usually find that the easiest way to work out your achocha is flowering is to wait for the hoverflies to arrive :) They are far better at spotting the tiny, pale flowers than we are! Hope yours fruit well for you.